I will freely admit, I’m addicted to my gadgets. Before I even get out of bed, I am on my iPhone or iPad, checking my email, Facebook, and the news for the day. It really is hard to believe that a decade ago it was so difficult to stay connected to everyone anytime, anywhere. Unfortunately, there is a downside to always being connected – everything always seems to run out of power at the EXACT same time. Due to the chargers for all of our gadgets and electronics, electrical outlets are in very high demand, making multi-port chargers a must in our household. The problem with many of these chargers, however, is that they don’t provide the full current a device can handle, or stop charging your phone or tablet once the battery is full, both of which can ultimately do long term damage to your device’s battery. Wouldn’t it be great if there was a device smart enough to recognize these devices’ needs and not shorten the life of your battery? 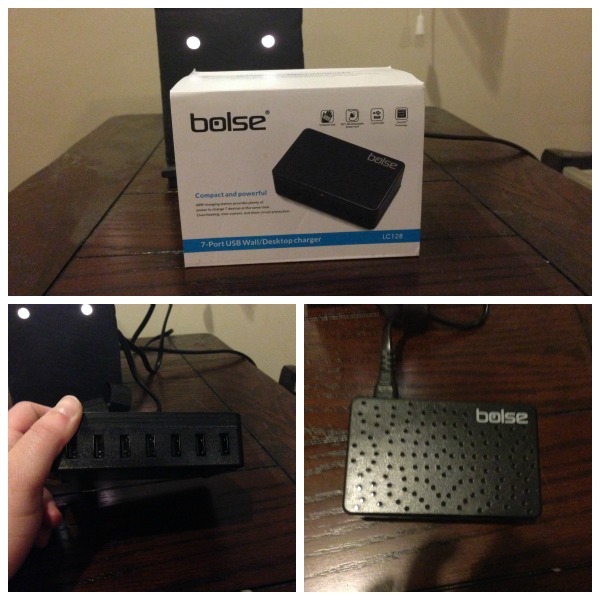 Recently, I found the perfect solution to this problem – the Bolse 7 Port USB Wall/Desktop Charger! Bolse 7 Port USB Wall/Desktop Charger: What Is It? Looking for a quality charger that is capable of charging up to 7 devices in your home without overheating or damaging your devices? 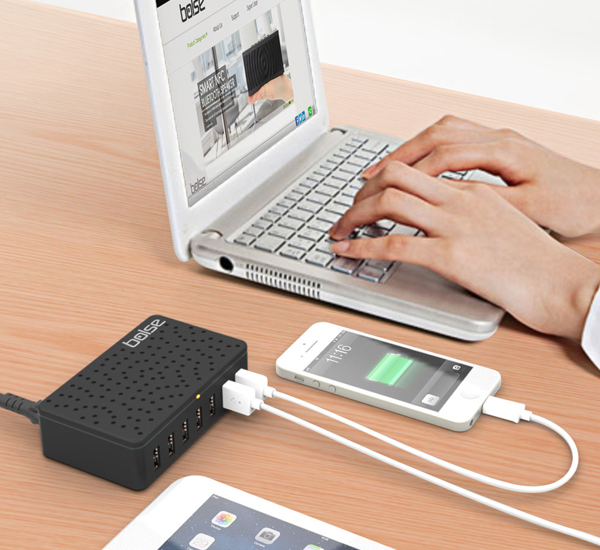 If so, we think you will love the Bolse 7 Port USB Wall/Desktop Charger. This innovative charger is unique because it has built in overcharge protection, allowing your devices to safely charge without the risk of overheating or doing long term damage to your devices battery. Normally, chargers send current to your electronics even after they are charged, putting them at risk. With the charger’s SmartIC™ Technology, it recognizes your iPhone, iPad, Nexus, Samsung Galaxy, and other devices, allowing it to know exactly how much power your device needs, and shut off the current flow once the battery is fully charged. Not only does it protect your devices, it charges them at a rapid speed with 25 watts and 5A total output. 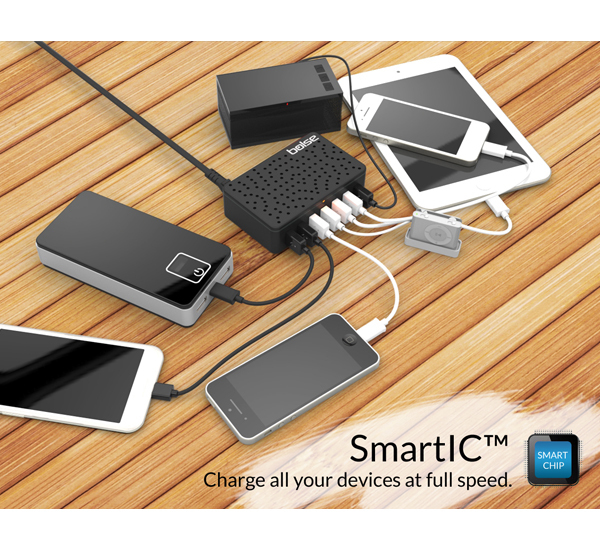 This means it can charge, for instance, up to 5 iPad Airs simultaneously! With the device’s compact size it is perfect for living on top of a desk or throwing in a backpack before your next trip. One thing is for certain, you will never be hurting for space to charge your devices again! Having used quite a few multi-port charges, I was impressed when I read the specs for the Bolse 7 Port USB Wall/Desktop Charger. While there are many chargers out there that can charge multiple devices at once I had never seen anything like their SmartIC™ Technology. While this technology makes the Bolse a bit more expensive than its competitors, it also adds protection that many of us really need on our devices. Let’s face it, every one of us will gladly pay an extra $20 if it protects the batteries in our $300 – $600 phones and tablets. Along with the technical aspects of this charger, I also love that it is so compact. It fits neatly in the small pouch of my laptop bag, making it convenient for long road trips or hotel stays where we have very limited room. Based on our own experience with this charger, I am happy to give the Bolse 7 Port USB Wall/Desktop Charger an A rating. Want to purchase this awesome charger for your own home? You can buy the Bolse 7 Port USB Wall/Desktop Charger on Amazon.com for $49.99. At the time of this review, however, this charger was on sale for $35.99. This is a limited time sale so make sure to snag this charger at this fantastic price! this is a really good charger. i would want one. Quite a convenience to charge several products at once. This would be a great product. which all seemed to need to be charged on or about the same time. I would love to have this!! It is so hard keeping up with chargers & all wanting the same outlet. Everyone needs one of there. Thankd for the chance to win. This looks super useful! I have so many electronics in my home that needs to be charged and this is perfect. I could definitely use this to save space and not have to maneuver everything. I have never heard of a charger that can charge multiple devices. I like that I can charge everything with one outlet! This is an awesome product! Boise products are always great, but to be able to charge several devices from one eletrical outlet just does it for me! Seems quite impressive. I like the functionality of being able to charge a few things all in one place at one time. Wow how awesome is this 🙂 charging seven products at once without having to worry about my devices getting ruined. Amazing technology when it knows to stop charging. This would be perfect for my family, we have several devices that need to be charged. This would be very convenient way to do it! I so could use this for my new home business I am trying to start. I am a part time home sitter/dog sitter. I am always loosing juice on both my phone and computer from being on the go. Wow! Love this charges up to 7 devices at one time, we have tablets, smartphones & bluetooth speakers plugs all over the house. This will help all of it central & organized looking too. Thank you for sharing. I could really use this, we have one outlet in our home that charges quickly,we could charge everything at one time with this. love your in depth review and your pictures! I REALLY want one of these now! I’ve always wanted something with so many charging ports but this one seems to be better than all! This sounds like a solution to my problem! When in a hotel room or an older home outlets are sometimes hard to find or reach so this would be perfect for the family’s devices. This can be really helpful when traveling; some hotels don’t have 5, 10 places to connect chargers or other things. This will be a fantastic giveaway to win. With 2 iPads & 2 iPhones in the house, this would really come in handy!! This charger is great for a family with multiple devices, which is just about every family nowadays. Charge the wife’s Ipod while you charge your cell phone also while the tablet is charging for the kids. It’s the best of all this and more wrapped up into one single devices so it saves all the hassle of having to find an adapter of another outlet. I would highly recommend it. We have so many devices to charge between 2 phones, 2 tablets and 2 laptops. This would be great to have to keep all the cords in one place! This sounds perfect for my new house. The rooms are big enough to fit a few devices in them & they’ll need to charge as well. Thank you for bringing this to my attention! My family is also a very electronic family and often check them before leaving bed too! I would love to be able to charge up to 7 devices at a time. This would definitely be handy around here. This sounds great for people that have a lot of devices/families. Thank you for sharing your review. Oh my gosh, this is so totally what I need!! It’s amazing when one looks at all the stuff we have then realizes in the older homes and apartments that there just aren’t enough plugs!!!!!!!!! We have so many, many extension cords to give more outlets for all the stuff we plug in, this would make it so much easier for all the cellphones and tablets, don’t forget all the kindles in the house!! Hehehe. This is on my christmas PIN IT list. Thanks! I had no idea there was a product out there like this one until I read your review. I really need one of these for all of my gadgets. This looks like it would be a great product! It would be able to charge all of my devices! I will have to look into buying one. This would be great for me and my grandkids, when we are all playing Minecraft together. Yes, they have Gran Gran playing and we all have to charge our ipods and tablets. We have a blast! It would be even better if we could all charge up together. Thanks. The Bolse 7-port charger sounds like a heaven sent answer that would eliminate many of my powering up techie needs. The SmartIC technology is such a worry free advantage. I often plug in devices to charge and forget to unplug them. A good charger is a great thing to have. I find my devices never stay charged long enough. Ok whoever invented this is a freaking genius! It seems like it would be an obvious product, something widely available at my local WalMart, because it’s just so danged needed. But I’ve never seen one before and wow i need one desperately! It is beyond frustrating to have a house full of people with all their devices and everyone is charging all over the house, or looking for their charger or looking for an open outlet. This thing is exactly what my family needs to keep the peace and sanity in our home! This would be so helpful to have. This is pretty neat and I could use something like this! I like how you can charge 7 different things at one time. It looks like a great charger. It would be perfect for use to all charge our phones at the same time. With the ability to charge several different items at once this would be perfect for my home. It never fails that when I start to charge my phone that my son suddenly needs to charge his. He doesn’t want to run upstairs to do that, so I end up waiting for his to charge before I can charge mine. This would eliminate the arguing over who gets the charger first! I love the fact that we can both do it at the same time, in less time than a conventional charger can do it. This is exactly the kind of thing I’m looking for! Between the three of us, we have three phones, two tablets, a Kindle, and a half dozen other USB-based devices that need charging. The price is right, too! this charger is cool! i like that it has a good bit of space to plug in the electronics! I would love one of these while I travel. The hotels never have enough plugs. It sounds great. I like that it can charge up to seven devices. We don’t have enough charges for all of our devices. This Bolse 7 port usb wall desktop charger looks like an amazing one to use. With all of us in the family having electronic devices having one is a must to keep everything charged up and ready to use.